Summer is flying and quite often, it feels as if June is busy with camps and sports but things begin to slow down around July. Swimming and playing are all fun, but don’t forget to read! Have you checked out your local library’s summer reading program? And then take your child shopping at Half Price Books with the “bucks” that you earn! Check out http://www.thecraftycrow.net/ for a great list of books to read each month, fun crafts to do, and other great activities. 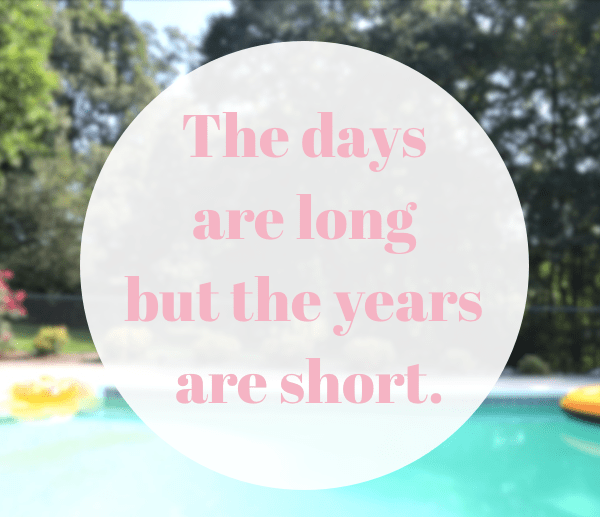 The weather is hot and sometimes the days are long. Yesterday I instituted “no screen day.” Did I tell you that the days are long? Years ago, when my children were preschoolers, we had many creative days spent baking, sewing, and creating art. Lately, it seems that screens have gotten in the way. 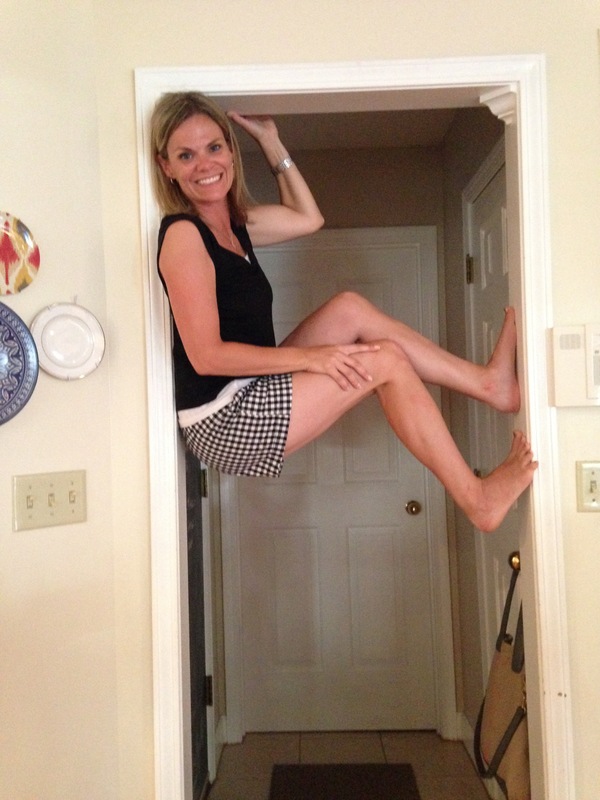 So our “no screen day” included banana bread baking, Scrabble flash playing and even a little (ahem) acrobatics. Hey, whatever it takes, right? The kids thought I was funny and it really didn’t hurt that bad. And, as always, perspective is everything. My oldest is 13 and when you think about it, I really only have 5 more summers with her before she’s grown. Hello everyone! What a summer it’s been so far! Can you believe the rain that we’ve had? It’s no fun when you’re all holed up in the house… I think we spent plenty of time there this winter! 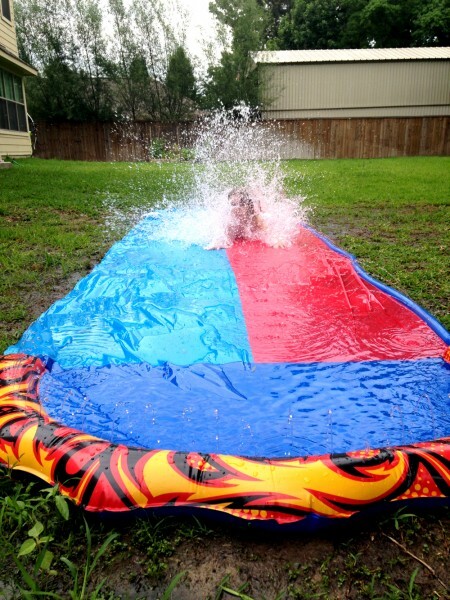 So, I’d like to continue my roll of posts of fun things going on around the area in order to help make this the easiest best summer ever with your children! Bass Pro has some great, easy, and FREE activities for you all to enjoy this summer! Click on the picture to learn more or give them a call for more information. Crafts happen every Saturday, Sunday, Monday and Tuesday from noon to 2:00 p.m. 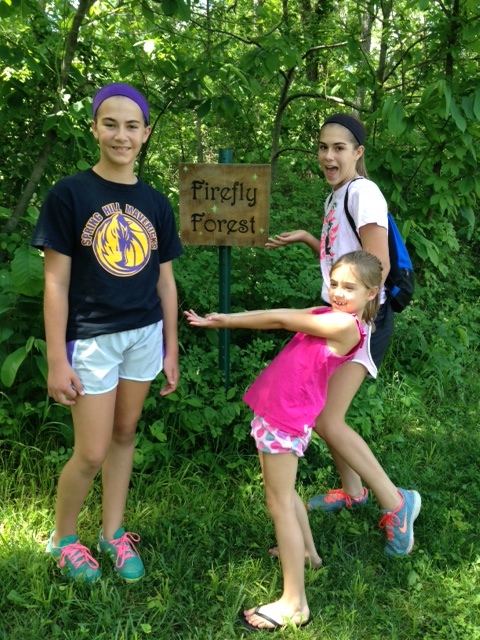 I have to share a little adventure that my children and I went on last week… to Firefly Forest! Perhaps you’ve heard of it. I know that I had for the past year or so but was unsure of exactly how to maneuver getting there and hiking it. We packed a picnic lunch and some extra water, drove to Deanna Rose Farmstead and parked in the older parking lot. If you walk to the east side of the farm along Switzer, you can take a sidewalk south to a walking trail. First we followed the path west (to our right) and found the entrance to the forest. There were three houses along the trail! It was fun to take in each and every detail. Someone went to a lot of work in putting each home together. And, I loved that they seemed so well preserved. After seeing the three little homes, we turned around and walked the other way (west) and ventured under Switzer on the path. 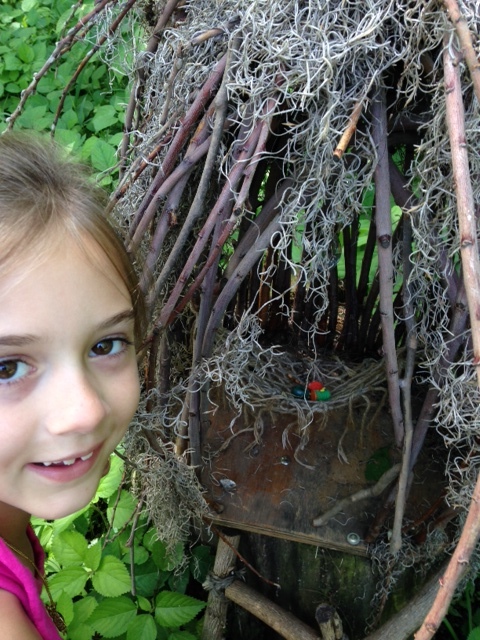 There were several sets of more fairy homes that we noticed (about three sets in all)! 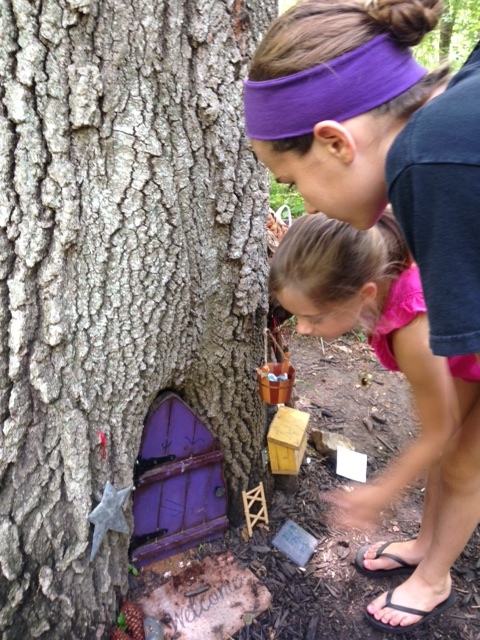 Some were set into trees with miniature doors and furniture and others were free standing. 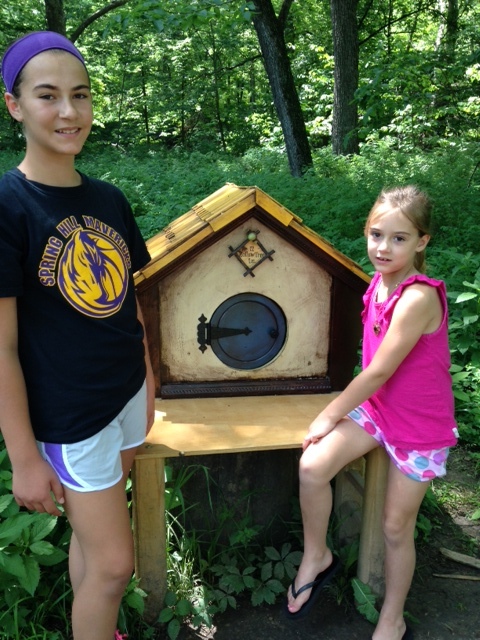 And besides the little homes, there were so many other things that my girls and I enjoyed: a little creek (which had a snake on a rock sunning himself), a large tree that had fallen over and had the prettiest green bugs on it, and so many other fun surprises in the forest! It was a fun little adventure that was very easy to do! For those who have little ones, I do suggest bringing a stroller because there is walking and it can get to be tiresome. There are benches along the way to sit and rest as well!